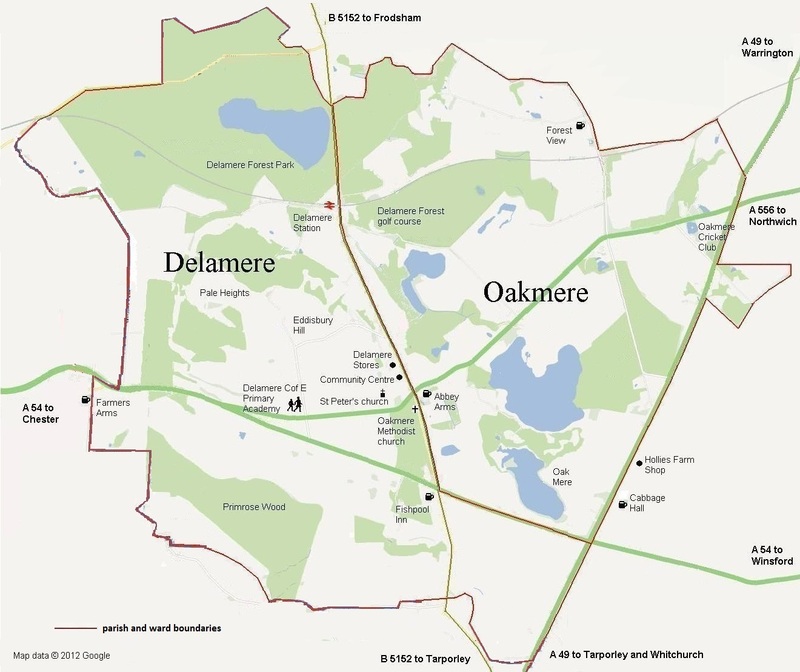 The neighbouring villages of Delamere and Oakmere are two wards of a single parish (Delamere and Oakmere) in the heart of rural Cheshire. They lie roughly mid-way between Chester and Northwich on the A 556, with a railway station on the Manchester to Chester branch line. The area is known in particular for Delamere Forest, which is Cheshire’s largest area of woodland. The forest is managed by the Forestry Commission as a community resource for the people of Cheshire and for holidaymakers and other visitors from further afield. A short walk out of the forest leads up to Pale Heights and the prehistoric hillfort of Eddisbury Hill, which form part of the spectacular Sandstone Ridge that runs north to south across the Cheshire Plain. The 34 mile Sandstone Trail, running along the ridge from Frodsham in the north to Whitchurch in the south, is one of the most popular long distance walks in the country, with many options for shorter walks in and around the parish. A second prehistoric fort is located on a promontory of Oak Mere, from which Oakmere takes its name. The mere was formed when three kettle holes coalesced to produce a shallow lake, and is now a Site of Special Scientific Interest. Outside the forest the area is mainly agricultural, and has a number of large sand quarries. The Little Wood and Bowyers Waste form an area of mature forest, wetland and grassland which has received a green flag award. A popular children’s play area located nearby. Oakmere boasts its own Cricket Club, and the Delamere Forest Golf Club has been rated as as one of the top 100 clubs in the country. The club welcomes visiting golfers as well as the many local residents who either enjoy playing the course or are members of the club. Delamere Community Centre is run by the Delamere Community Association, which supports a wide range of community activities and boasts an adjacent crown bowling green. There are two churches in the parish – St Peter’s Parish Church and Oakmere Methodist Church. The Church of England primary school is located a short distance from St. Peter’s Church and was opened in 1846 as Delamere Forest School. In 2009 the school achieved the coveted ‘Outstanding’ Ofsted grade and became Delamere C of E Primary Academy. A nursery school is situated alongside it.